Physician endorsed, and pharmacist recommended, this all natural, unscented topical rub gives fast, temporary relief of minor aches, pains and discomforts. Packed with Emu Oil and other natural ingredients that provide anti-inflammatory and anti-oxidant benefits this specially formulated rub also contains MSM, glucosamine, chondroitin, cox2 inhibitors and aloe vera. 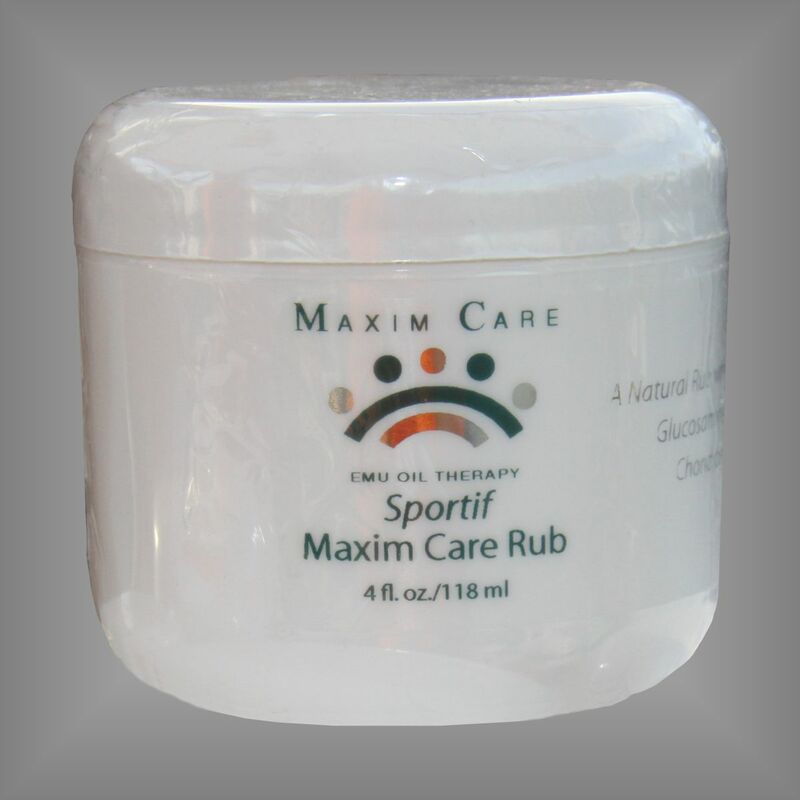 Sportiff Pain Away Rub is a mild, but extremely effective formulation of natural pain relieving ingredients for those who have a sensitivity to capsicum or menthol. Also contains the key ingredients; glucosamine and chondroitin which is necessary for the repair of joints and cartilage. Whether you are experiencing painful sore muscles from sports injuries, tired, aching joints from a hard day on the job or just an occasional stiffness associated with lifes everyday activities our Sportiff Pain Away Rub brings fast relief of symptoms from tendonitis, sprains, strains and sore muscles. For severe sprains and strains, we recommend Sportiff Arctic Heat. All natural emu oil is being recognized by medical researchers as one of the best natural pain relievers ever discovered. When combined with other proven pain relievers, emu oil enhances their effectiveness by acting as a carrier and improving their absorption into the skin. Experience the difference of emu oil! Directions: Apply a small amount to the painful area and rub thoroughly into skin. For deep or severe pain, we recommend a second application in approximately ten minutes. Apply as needed for pain. If irritation occurs, discontinue use. Avoid contact with eyes, face, broken or irritated skin. Ingredients: De-Ionized Water, Emu Oil, Cetteryl Glucoside, Triethanolamine Salicylate, White Tea Extract, Tocopherol Acetate (Vitamin E), Glucosamine, Steric Acid, Niacinamide, Allantoin, Chondroitin Sulfate, MSM, Aloe Vera Extract, Chamomine, Ginseng Extract, Calendula Extract, Ethanol, Polyacrylamide ( and) C13-14 Isoparaffin (and) Laureth 7, Germaben IIE.